In 2011, CEMI received $823,000 in funding from the Northern Ontario Heritage Fund Corporation’s Emerging Technology Program to go toward a research chair for holistic mining practices. Sudbury MPP Rick Bartolucci made the official announcement and welcomed the new Chair, Douglas Morrison to the position. Douglas Morrison is also President &amp; CEO of CEMI. CEMI has seeded several small chemical/biochemical projects looking at various aspect of treating sulphidic tailings, especially those that contain pyrite and pyrrhotite. 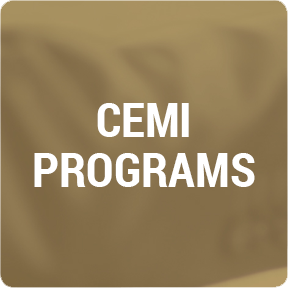 This is primarily an effort to engage non-mining LU Faculty who can connect CEMI to a much wider scientific community, capable of addressing environmental issues as well as secondary extractive techniques. Increased competitive economic interests related to water access and availability, as well as the cost of water for use in mineral processing, is driving the need for new approaches to sulphidic tailing treatment. At relic mine sites across the Province, the potential exists to reprocess waste materials to recover previously left behind mineral values and reduce the long-term environmental impacts of these sites. New approaches to mineral processing and waste and water treatment that take advantage of remaining mineral values at these sites are currently being evaluated. CEMI is also evaluating whether these approaches can further reduce or eliminate the requirement for long term institutional monitoring and maintenance. The development of these new technologies would help to address the needs of government and the mining industry. Additionally, it may present economic opportunities for First Nations communities near these sites. In Ontario, the ‘Ring of Fire’ mineral developments are being conceptually designed with conventional approaches. CEMI is taking a more innovative and strategic approach, using the ‘Ring of Fire’ development as the catalyst to transform the social and economic conditions in the Far North and create an entry point for First Nations people into the northern economy. Our hypothesis is that tortation of equipment, supplies and the final end product of the mining operations. We expect this approach will accelerate the rate of development of mineral deposits and reduce infrastructure capital requirement in the short term. These ‘Ring of Fire’ developments can enable the establishment of manufacturing and support centres to meet the needs of development in the Far North while establishing commercial enterprises with the capacity to expand and accelerate the development of the Northern Ontario frontier communities and other northern environments.